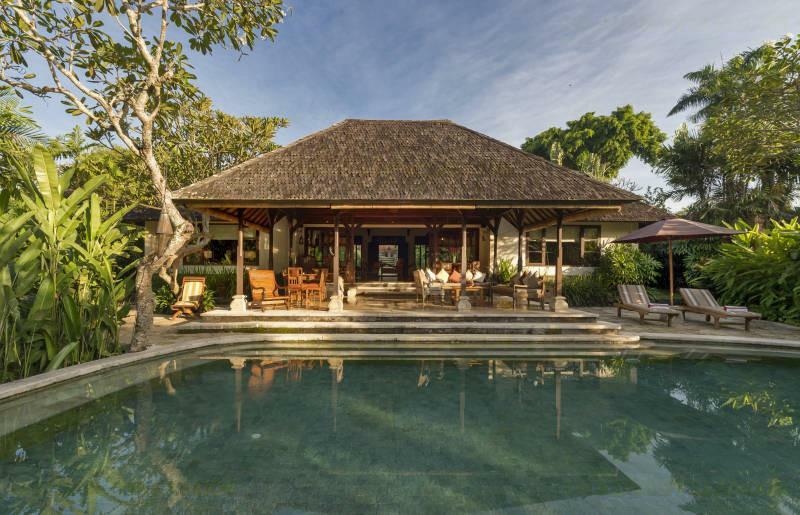 The villa is a 4 bedroom rental villa, a peaceful rural sanctuary, nestled in the rolling green rice terraces near Canggu in Bali. 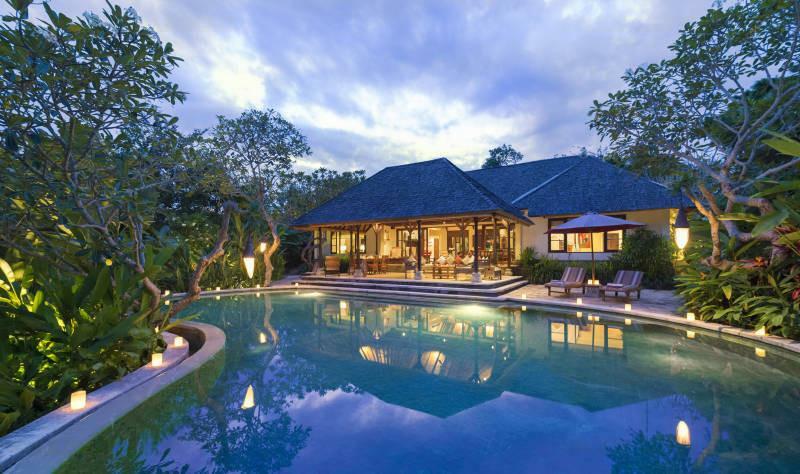 The villa is built on the side of a small valley, with a tranquil river at the foot of the garden. 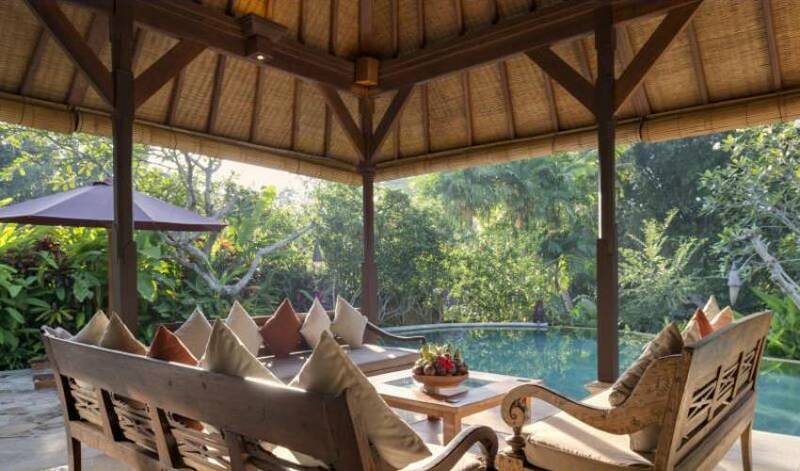 This charming traditional Balinese style rental villa is hidden away from Bali's worldly hustle and bustle, enveloped by tall trees and mature gardens to ensure total privacy. 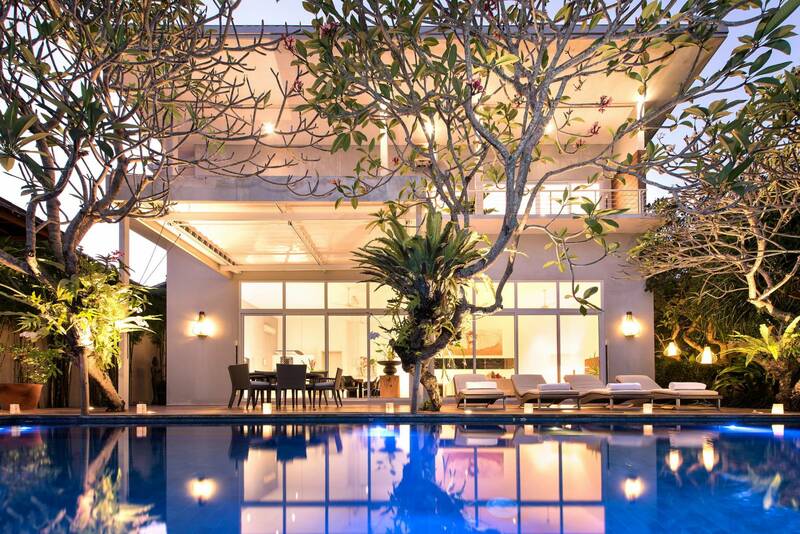 The villa is a luxury rental villa which has been designed and built by the group that built the Four Seasons Bali, ranked as the No. 1 resort in the world by Conde Nast Traveler Magazine. 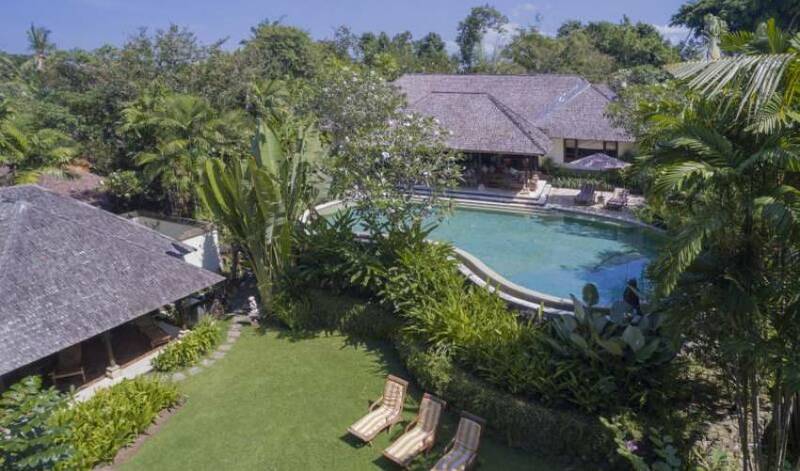 There is a main house as well as a separate guest bungalow. 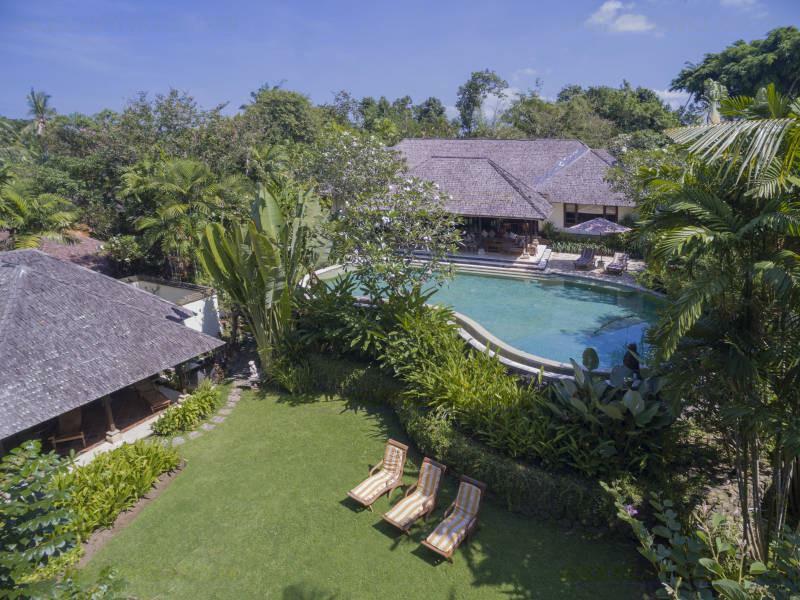 Built in traditional Balinese architectural design, this tasteful property has high woven bamboo ceilings throughout, with 4 large bedrooms, a study, and a spacious indoor living all within one building area all with views of the surrounding tropical gardens. 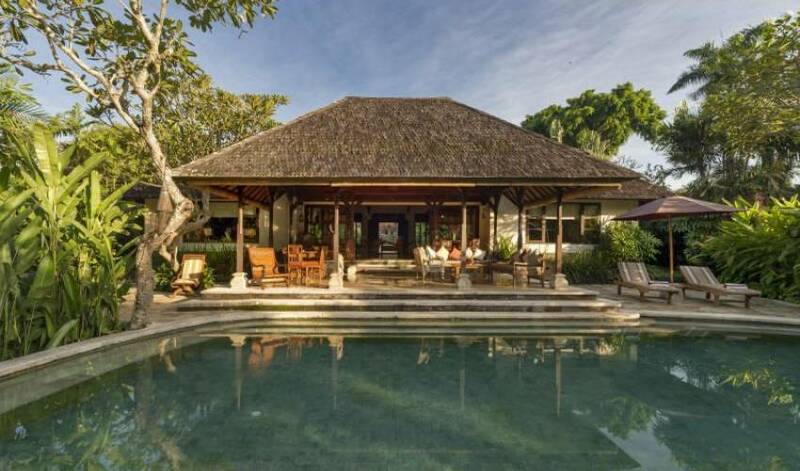 The villa has been beautifully furnished by the owners with antique furniture and artifacts sourced throughout the archipelago. 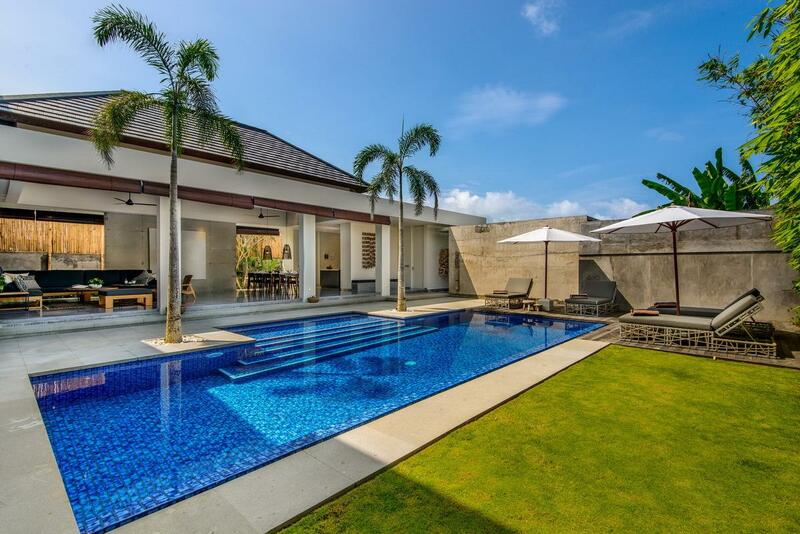 A large outdoor entertaining pavilion steps down to a large, beautiful stone swimming pool overhung with fragrant frangipani and adorned with antique stone statues. Concealed at the bottom of the garden is a separate bedroom bungalow with en suite facilities. 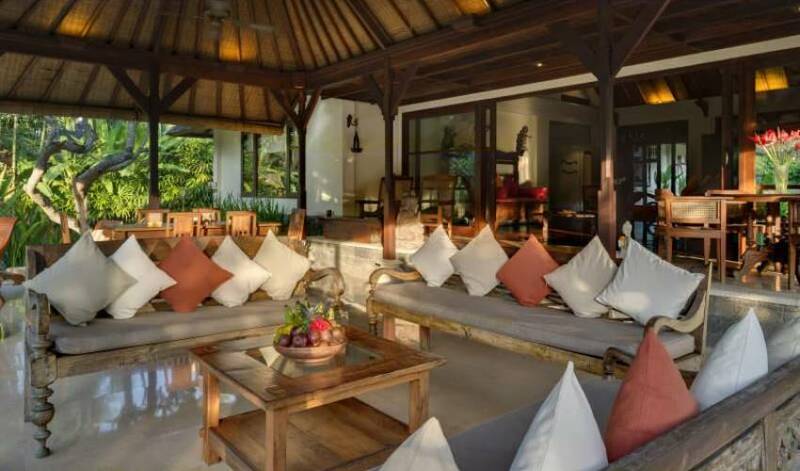 The bungalow is fronted by its own covered terrace, which overlooks the gardens. With its proximity to the river, this is the perfect spot to sit and watch colorful kingfishers and other native bird life, flitting up and down the river valley. 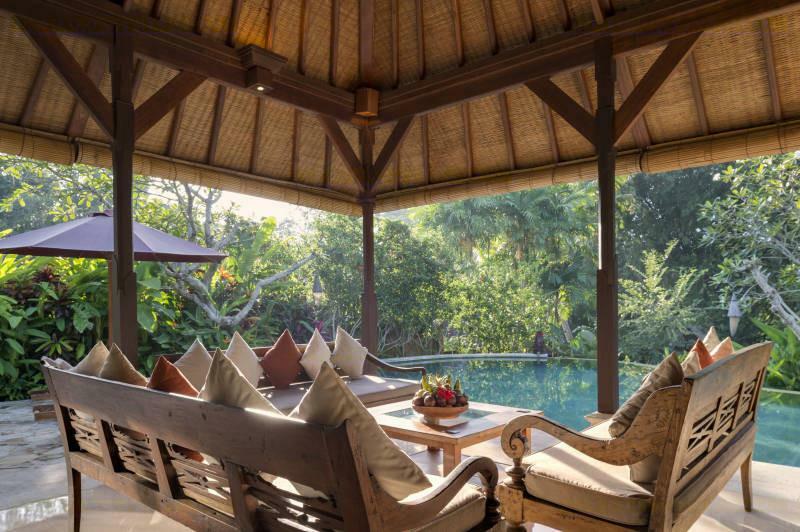 Guests enter through Balinese gates & walk across fishponds onto indoor living and dining area. Lounge space has been created for up to 8 people, including a double day bed, A/C, 2 ceiling fans, TV with satellite channels, VCD, VCR, CD stereo. A full selection of movies, CDs, books and board games are available. 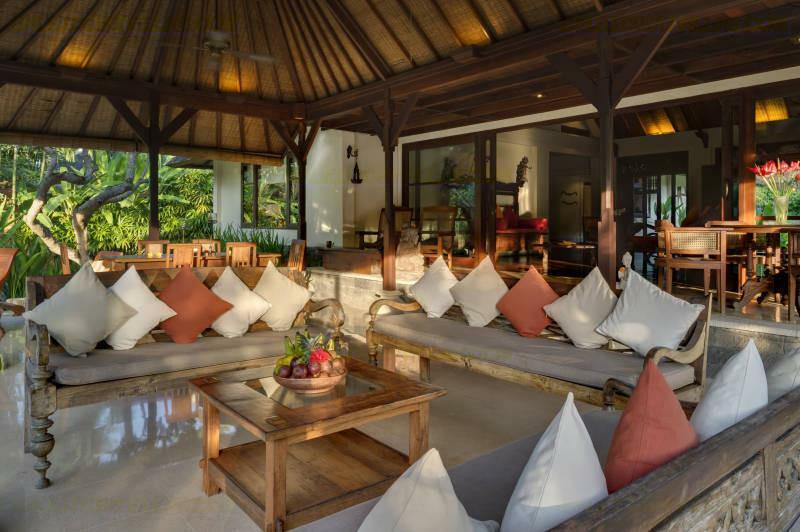 The dining area of this villa seats 8 comfortably. French windows open onto covered open living area overlooking pool. 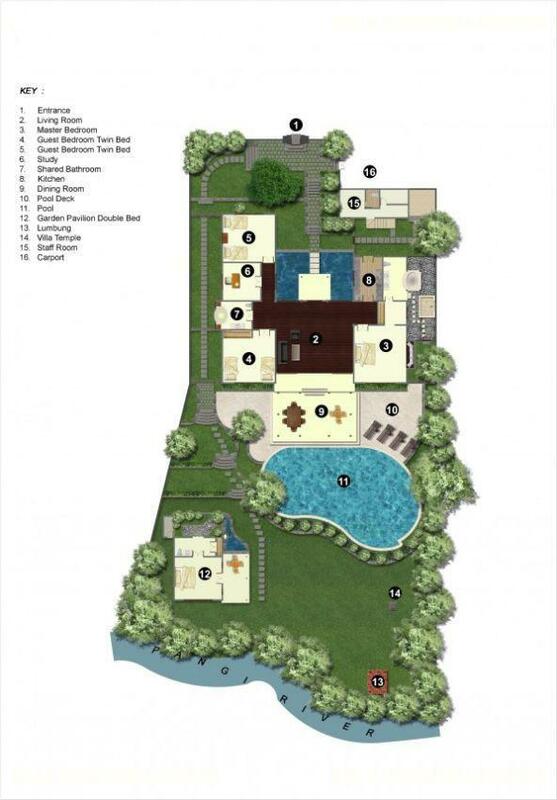 Lounge seating for 6, with additional breakfast area for 4. Beyond the kitchen is the laundry area with washing machine and dryer. Three of the bedrooms connect with the indoor living area, as does the fully equipped kitchen. 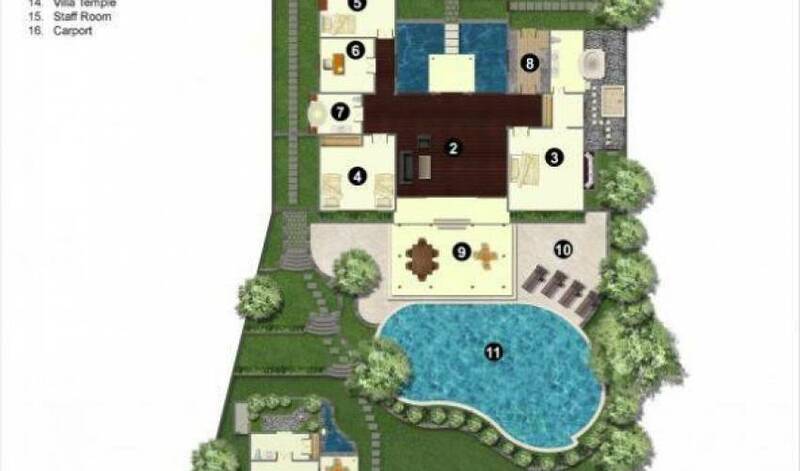 The master bedroom, with a four poster bed draped in fine netting, leads to a walk-in wardrobe made out of tall antique doors and an exquisite outdoor garden bathroom with sunken terrazzo bathtub, double wash basin and shower. In addition the master bedroom offers A/C, overhead fan and safety box. The two guest bedrooms are located off the opposite side of the living room and both feature twin beds with mosquito nets, A/C, fan and safe boxes. These two guest bedrooms share a large bathroom with cream colored terrazzo bathtub/shower, wash basin and toilet. The study room is located between the guest rooms and guest bathroom of the main building. 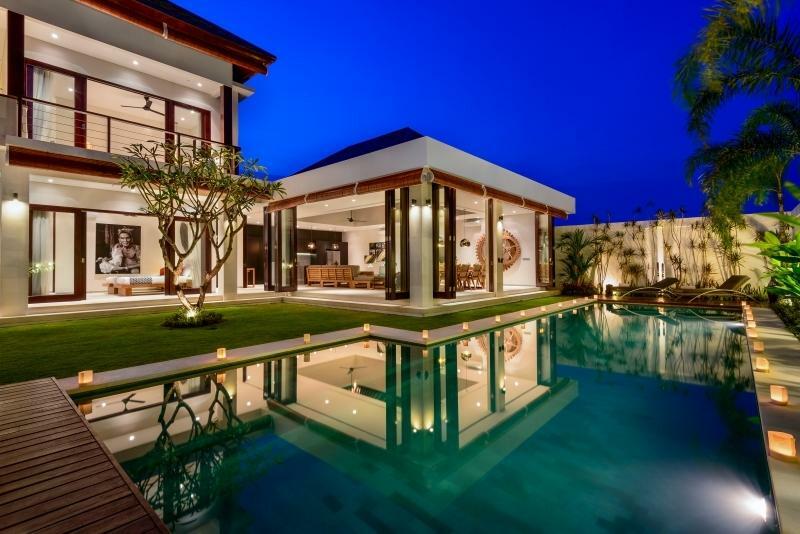 25 minutes (5.8 km) drive to Seminyak Night Life, 30 minutes (6.8 km) drive to Seminyak Center, 55 minutes (12.6 km) drive to Ngurah Rai International Airport.